– The man the myth, the legend! 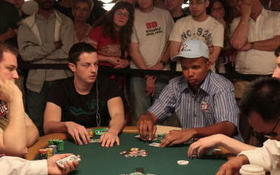 Ivey is widely considered the best all-around poker player in the world (perhaps history) and you can’t argue with his results. – Dwan is the biggest star of the online poker world, so much so that most refer to him by his online poker screen-name ‘durrrr’. – Isildur1 took the online poker world by storm in late 2009 with his ultra-high-stakes action, and although he has lost millions in the nosebleed games, Isildur1 parlayed his reputation into a sponsorship with PokerStars. – South is considered one of the top poker players, and poker coaches in the business; the former Cardrunners instructor is always among the year’s top online poker winners. – Galfond may well be the best poker player in the world, but his low profile keeps him out of the public eye –so he is much like Phil Ivey in that respect. – Cates is online poker’s next big thing, and while he battles durrrr in a million dollar challenge match, he has also been the biggest winner at the high-stakes poker tables in 2010 –winning over $4 million! This entry was posted on Wednesday, December 22nd, 2010 at 5:02 am and is filed under Poker News. You can follow any responses to this entry through the RSS 2.0 feed. You can leave a response, or trackback from your own site.